Capitol Canine Club allows dogs to play cage-free with other dogs while also practicing some basic training and manners. The dogs are walked outside before and after play times, and are given a nap period mid-day. This program allows dogs’ maximum freedom to run, play, and interact with other dogs while being closely supervised by trained staff. Our Club offers pets a doggie day care experience with the same high quality of care that is expected from Old Dominion Animal Health Center. Book your dog in for a play day and see how much he/she does not miss you while you are at work! A busy dog is a happy dog! Capitol Canine Club understands that good — and energetic! 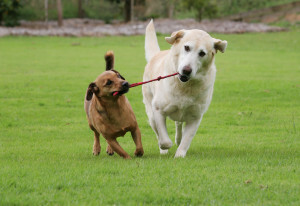 — puppy socialization experiences are essential to development of well-adjusted adult dog. That’s why we cater to the unique needs of puppies. Our younger members play in a safe, clean, and secure environment with fellow puppies and other playmates of appropriate temperament under the close supervision of our experienced staff. Puppies receive frequent potty breaks and well-deserved nap times. Additionally, we will reinforce good behaviors, encourage bite inhibition, and work with your puppy to build good social skills. 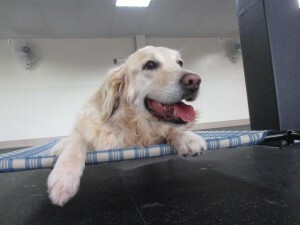 Older dogs can enjoy day care too. Many senior dogs need extra potty breaks during the day and find the presence of a human comforting. Your senior dog can spend the day being pampered and petted, without having to participate in the more active day care groups.